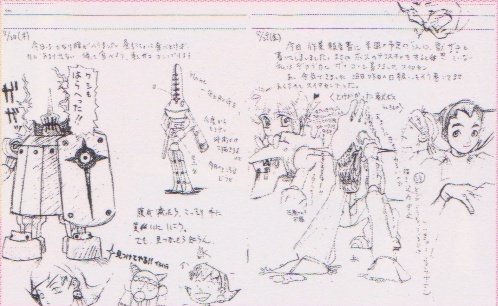 Just as Capcom had done for the release of Rockman X, the development team behind the latest Rockman series set out to show off some concept art and answer the fans’ questions about the direction of the game, how it fit into the overall scheme of Rockman, that sort of thing. Or to at least give enough background so that we’d want to get the game and find out the answers for ourselves. Too bad that the relatively low circulation numbers for both Club Capcom and CAP! made each of these features obscure material even for Japanese fans, undermining the effort. But that also makes them both rare gems! Here, let’s tackle the mystery surrounding the term “Digouter”. Literally, it would probably mean something like “treasure hunter”, but that probably gives off too much of a connotation of greed or just looking out for one’s own selfish interests. In fact, a digouter’s work is actually considered to be a well respected occupation where we come from! You see, in our world, the prolonged wars of the past have led to widespread energy shortages. And unless someone can provide those energy resources, our society will crumble apart! Like the ancient civilizations of Mesopotamia once their lush forest resources dried out, our way of life would have to be disbanded. Digouters are courageous fellows willing to brave the dangers of the ancient ruins to seek out the energy resources known as Deflectors and bring energy back to the people. Of course, there are some bad apples among them too. Greedy, misguided people who are just out to get rich quick, only looking out for themselves and bothering all the folks around them. I guess there’s always going to be a few annoying types like that around! Now for our next mystery, just what are Roll and Rock and the others supposed to be? Are they humans? Hmm, this question’s a bit tricky. First, let me ask all of you, what does it mean to be distinctly human? Are the differences between humans and robots really that clear? You might say that the “presence of sentience” is where the line should be drawn, right? But then, aren’t emotions, intelligence, and self-awareness all phenomena caused by chemical transmissions in the brain..? Some nihilistic scholars of physiology have even said that “humans are, after all, merely biological machines which from a series of chemical reactions can give off the appearance of independent action.” It’s a heavy subject, and humanity is difficult to define. I guess what I’m trying to say is, I really can’t say what Roll and Rock are. Maybe you can figure it out! Okay, up next we’ll examine the mystery concerning this adventure’s setting. The world we live in is, simply enough, the Earth. It happens to be the same Earth that the Rockman series and X series took place on! 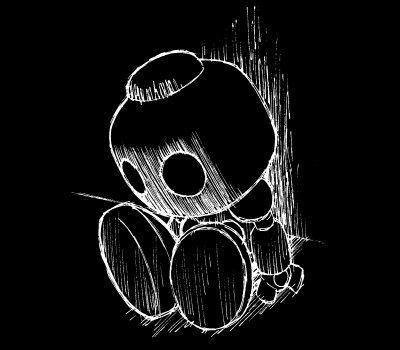 But as to whether this takes place in the future or the past of those events… I’m actually not allowed to tell you yet. It’s a splendid tidbit of key importance. Although it’s not really brought up in the basic story outline, just the fact that this connection exists behind the scenes adds a spicy layer of tension to the narrative, don’t you think? Looks like I’m running out of time, so let’s get down to our final mystery! And it’s the greatest mystery of all… When is this game going to be out!? Is it scheduled to be on sale soon? Our first bit of evidence is a daily report (Exhibit 1)! These kinds of progress reports are performed every day to ensure that the project stays on schedule. Looks like it’s about new characters, I think I know whose this was… Do you see this? There’s scribbles all over the place! Of course, all that drawing in the margins can raise employee morale, and it does add a certain appeal!! His boss probably upped his workload after this!! Next, this one appears to be a weekly status report (Exhibit 2). They’re used for the project manager to keep on schedule just like the dailies, but this one covers the progress of an entire week. And hey, this one has a fun little scribble, too. It sure seems like there’s a light atmosphere at the studio. I’ll bet it’s a fun place to work! This one looks like a motion assignment spec (Exhibit 3). That’s actually a company secret. (Is it even okay to show this? Is that project manager still around!?) 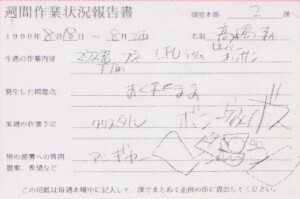 Oh, this one has some cute little drawings, too. Is that an artist’s self-portrait I see? Looks like he’s vomiting up some blood. Hey, if you’re really puking blood you should get to a hospital, don’t just stay sitting there drawing yourself! 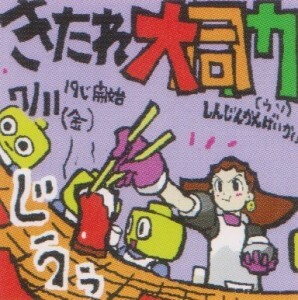 An illustration used to announce the team’s internal barbecue cook-off. Data: Surely, everything will come together and fit the schedule. I can almost hear the panting and wheezing of all those cheerfully procrastinating designers having to pull a last minute scramble! That’s all right. What a relief! I’ll be looking forward to meeting all of you this Christmas! Well, until then!! You might hear me say this a lot, but the DASH series has always shared a generous amount of their developmental and creative processes with the fans, even long before the Legends 3 Project hit the scene. Perhaps that is the natural progression from a franchise whose roots have involved boss submission contests for nearly as long as can be remembered. By the way, the designer from Exhibit 3 is sick because his work got deleted. Seemingly a common problem among game developers at the time… Unless that’s just something they tell their boss when they put off their work for an entire day. 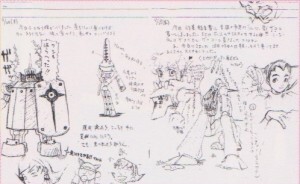 There’s some great concept stuff of the Bonnes and some reaverbots in Exhibit 1, too. A shame it’s all printed so small. So, what else are we taking away from this? For one, we’ve learned that before the first installment in the series even been released, the developers had alluded to the artificial nature of the decoys (or carbons, if you prefer). In the tradition of the classic series and X series before it, DASH continued to push the envelope on thinning the line between synthetic beings and their human counterparts. When robots can perform at the same level with the full complexity of man, does the distinction become purely academic? Heavy stuff, indeed. Thousands of years into the future of the “X” series, the adventures of the Digouters take center stage! 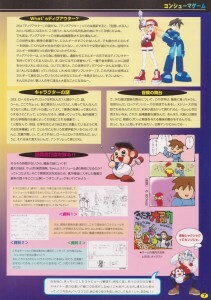 The Rockman series’ first 3D action game! DASH stands out from the rest of the series with its up-tempo story, its rich fully-developed characters, and its vast 3D world to explore! Experience the legend of the Digouters, and their grand adventures exploring the ruins of ancient civilizations! Their world’s subtle links to the previous series entries have also been a delight for the fans!! 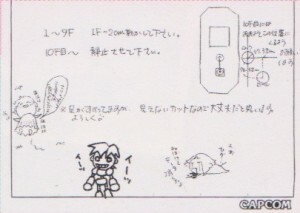 “Delight” might be subjective depending on what circles you run in, but Rockman Perfect Memories made it clear for many that classic Rockman, X and DASH were in fact irrevocably linked, and that DASH was the final destination of the Rockman world. Some fans do enjoy knowing it’s part of the whole, while others don’t think it needs that sort of connection at all. The cool thing about DASH is, it works as both a stand alone story and as a cog in the grand scheme, which is something I think those on either side of the equation can equally appreciate. So, what about Zero and ZX? 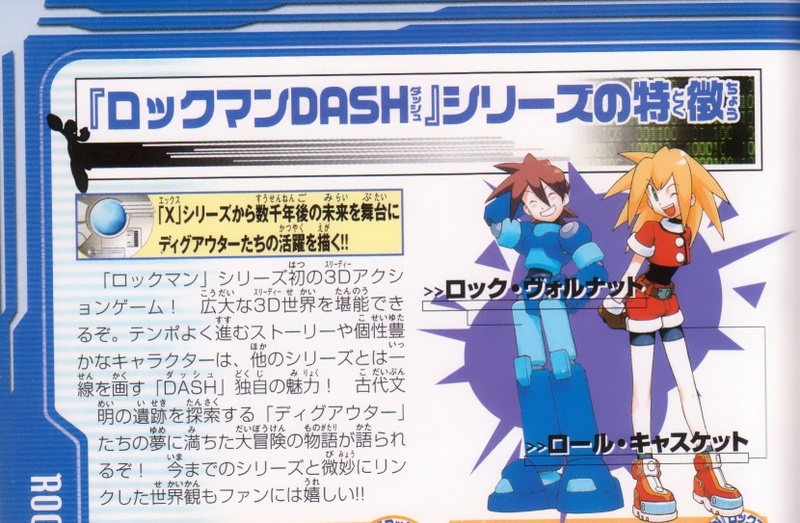 Might the DASH series be offshoot of Rockman X5‘s bad ending (where the world is flooded, and X speaks of building his own Heaven/Elysium utopia)? If so, then shouldn’t it have nothing to do with the other series like Zero? Well, this is just our own personal opinion, but the way we see it, the end of the Mega Man series has already been written in the form of [the] “Mega Man Legends” [series]. We feel that no matter how you continue the Mega Man series, you’ll always end up at Legends. Therefore, we feel that everything we have created has, in a way, laid the ground work for that world to come into existence. We have to make sure that things like the environment and human-Reploid relations that we establish will be able to make a comfortable transition to that future world. 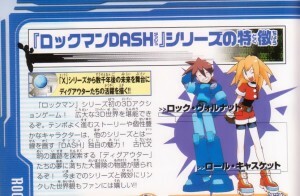 As it stands today, DASH 3 will be the last chapter of the entire Rockman saga. By last, of course, I only mean chronologically. Who knows where we’ll go from there, but I’ll be very excited to see it! That’s all for now. I’ll see you at the Devroom, DASH fans! 7 Comments to "Dr. Data’s DASH Dissertation"
Lots of interesting info there. @Amp: Sorry about that! Good thing we didn’t have to break out the CPR. I’ll put a disclaimer on here next time that the Lav is not responsible for induced cardiac or other medical conditions. Read at your own risk! @Rad: It’s insane how much confusion there is about this! You might say that just because the developers intended for it to be that way, doesn’t mean it was always portrayed like that. Even in Japan! That would be another good subject to write on. Wow, to think Japan had all this info, and before the game was even released! It drives me crazy to think that technically, the Classic/X connection was never officially made in America… at least, not until MMZOCW, at least (that I’m aware of). I still remember when you first translated that bit of text from RPM. It was such a bombshell… I think my mind was blown, not by the connection, but just by how nonchalantly they seemed to be about it. They did get quite a head start (or at least, those who were in the fan club did). I think you’re right about the connection, too. 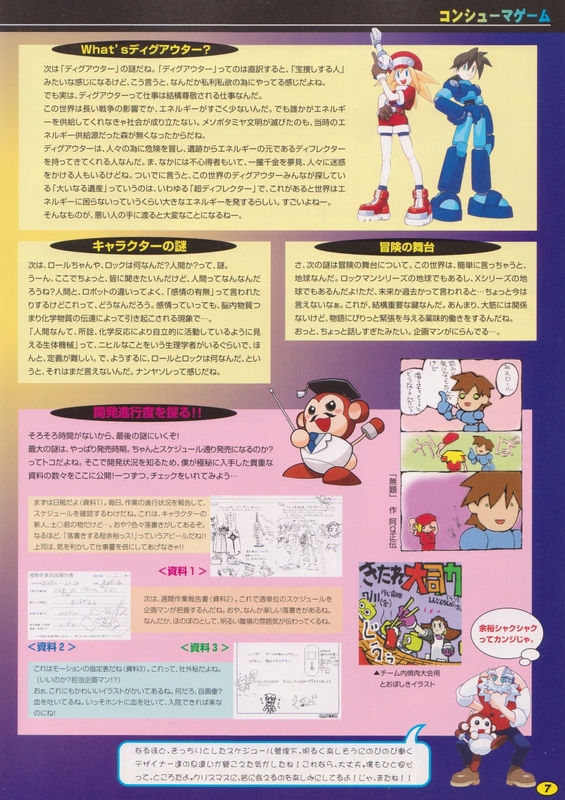 Hardly the first time Mega Man and Rockman portrayals didn’t see eye to eye, of course, but with the Legends timeline issue we weren’t just not told, we were told the exact opposite! Was it a miscommunication, or a calculated marketing decision? I can’t say for sure, but I do know that despite the above text, there was a lot of confusion in Japan initially as well. Hitoshi Ariga thought it was supposed to be a completely separate world for a while, and wrote about it before. Guess he didn’t belong to the fan club back then! I was wondering, what was going on in that little comic where Roll takes off her hat? Oh yeah, I did kind of skip over that one, huh? Basically, Rock asks Roll why she doesn’t take her hat off, but isn’t prepared for the answer. Iceman vies for the number one slot!